Courtesy of Maine Department of Inland Fisheries and Wildlife Bonnie Holding of Coplin Plantation (center) poses with her plaque alongside Maine Department of Inland Fisheries and Wildlife Commissioner Judy Camuso (left) and deputy commissioner Tim Peabody after receiving the Wiggie Robinson Legendary Maine Guide Award on Saturday night in Brewer. 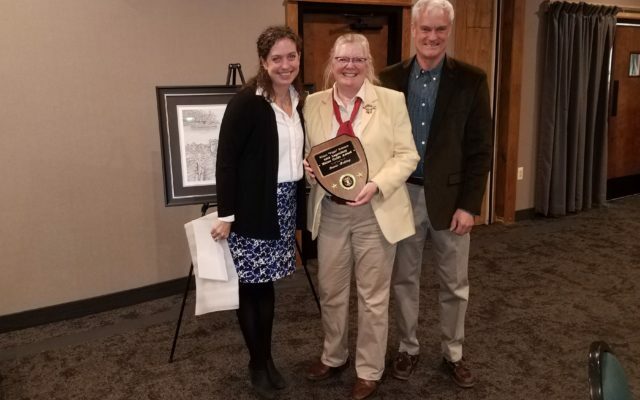 The Maine Department of Inland Fisheries and Wildlife on Saturday night honored Holding with the Wiggie Robinson Legendary Maine Guide Award during the Maine Professional Guides Association annual banquet held in Brewer. “This award is extremely well-deserved, and it is an honor to recognize Bonnie for her distinguished work as a guide and a pleasure to recognize the first female recipient of the award,” MDIF&W Commissioner Judy Camuso said in a release. Holding has been a Master Maine Guide for more than 30 years and has guided every year for three decades. In 2008, she was honored by Outdoor Life Magazine as one of the top four female guides in the nation. Holding also is a pioneer with Casting for Recovery, a national program that uses fly fishing and its related skills to help women recovering from breast cancer. “Bonnie’s passion and dedication for helping others through the Casting for Recovery program is legendary, and she is tireless when it comes to advocating and raising funds for this incredible program,” Camuso said. In part through Holding’s efforts, Maine has the longest running Casting for Recovery program in the country. Casting for Recovery in Maine has raised hundreds of thousands of dollars and has aided many women. Maine is also the only state that hosts a Casting for Recovery reunion that includes alumnae from the program and attracts survivors from all over the Northeast. Holding also holds an annual fundraiser, Fish Tales and Cocktails, each January that attracts dozens of people from all walks of life who are willing to donate time and money to Casting for Recovery. Through the program, Holding has spent countless hours teaching many women an appreciation of fly fishing and give them a moment to forget about their illness. The Wiggie Robinson Legendary Maine Guide Award is presented annually to a candidate who has been a Registered Maine Guide for 20 years and who has been an active guide for at least 10 of those years. Winners also must be active in the local or outdoor community, or serve on boards or committees that enhance and promote the importance of Maine’s outdoor resources.